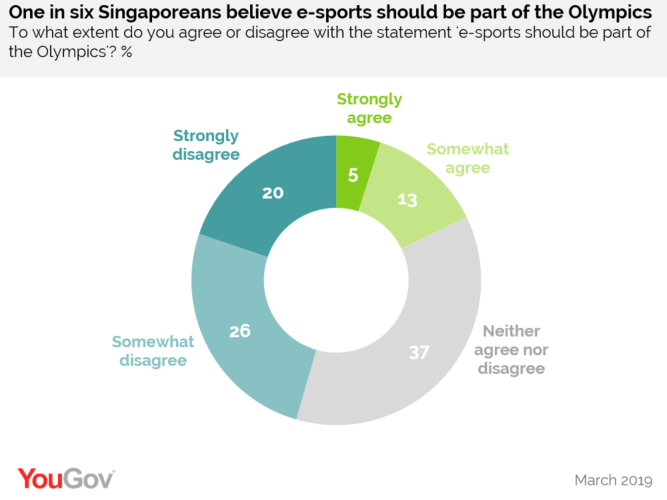 on April 4, 2019, 10:57 a.m.
Just one in six (18%) Singaporeans believe e-sports should be part of the Olympics, new research from YouGov reveals. With the debate about allowing computer sports should be allowed into the competition continuing, the research among Singaporeans reveals that nearing half (46%) don’t think it should be, with more than a third (37%) being undecided. Those aged 18 to 24 are most likely to think of e-sport as an Olympic sport, with a quarter (25%) agreeing – with one in ten (11%) of those aged 55 or above thinking the same. YouGov’s data reveals that a quarter (23%) of Singaporeans believe e-sports constitutes a sport, with men being more likely than women to hold this view (26% vs. 20%). This figure increases to 36% amongst those aged 18 to 24, and further increases to 50% amongst those who are active players of e-sports. E-sports is a rapidly growing industry, one that’s currently valued at $138bn globally, with more than 2.8 billion active gamers across the world. Currently, a quarter (24%) of Singaporeans are active e-sport players. There are more male gamers than females (33% vs. 15%), and among those aged 18 to 24, almost half (48%) currently play some form of e-sport. Overall, Singaporeans have quite a negative view of e-sports. Large proportions think they are detrimental to either physical (54%) or mental (44%) health. A quarter (26%) think they are a waste of time, and two thirds (64%) believe that e-sports causes Internet addiction. Although over four in ten (47%) think e-sports are intellectually stimulating, most think they should be discouraged, particularly among children. While two in ten (19%) think they should be discouraged amongst adults, half (49%) think they should be discouraged amongst children. Women are more likely to think this should be discouraged amongst children than men (54% vs. 43%).